The Tara Afghan Hound Club had applied to hold it's regional speciality over the week of the National Speciality but the AKC did not grant the request, citing as their reason the distance from Atlanta. In the event Tara AHC hosted the Welcome Reception in true Southern fashion and this was enjoyed by all. . Lure Coarsing was held on Sunday, Agility, Obedience and Sweepstakes was held on Monday. BIS Sweeps was CristonWhistle in the Dark with BOS going to Verpatscha-Boanne Night Whisper. Sweeps judged by David Giordano. A colorful ringside with various vendor settups adjacent, including artist vendors, Rescue table, Art Auction table and the lovely Karen Armistead with her table loaded with materials on the history of the breed. 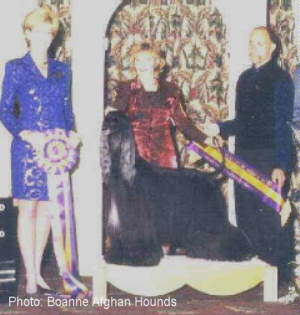 Tuesday Jan Reital (Tifarah) judged the dogs, and chose for her main awards - WD Polo’s in the Air Tonite , RWD Shekinah Stiletto.